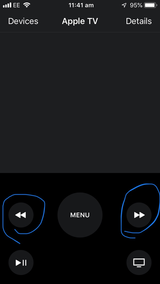 What are the various ways to skip a song on youtube on Apple TV using the iOS remote app or Apple Watch remote app? Currently, it seems like the easiest way to do this is to just fast forward till the end of the song. 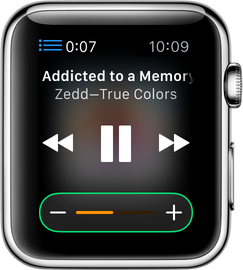 What are the gestures on iPhone to skip a song and how can I do this on my Apple Watch? to fast-forward in a song. Rewind: Tap the 10 icon to skip ten seconds back in a video. Or tap Rewind to rewind in a song. Not the answer you're looking for? Browse other questions tagged iphone appletv apple-watch remote.app . Log into the iOS YouTube app (iOS 4.2.1) OR Export favorites some other way? How can I remove or hide the stocks app from Apple Watch? Can the Apple Watch app be side loaded and used on other iOS devices? Is the companion iPhone app mandatory for Apple Watch apps? How do I send a set of youtube URLs from a Mac to the youtube app on Apple TV?